Welcome to Tr3 Trends, NCTQ's monthly newsletter designed just for school district officials. Each month, we use data from NCTQ's Tr3 database to highlight the latest trends in school district policies and collective bargaining agreements nationwide. Tr3 contains teacher policies from 114 school districts, including the 50 largest districts, the largest district in each state, Broad Prize winners, Gates investment districts and members of the Council of the Great City Schools. In 2012-13, the average salary in Tr3 districts for a first-year teacher with a bachelor's degree is about $39,000. 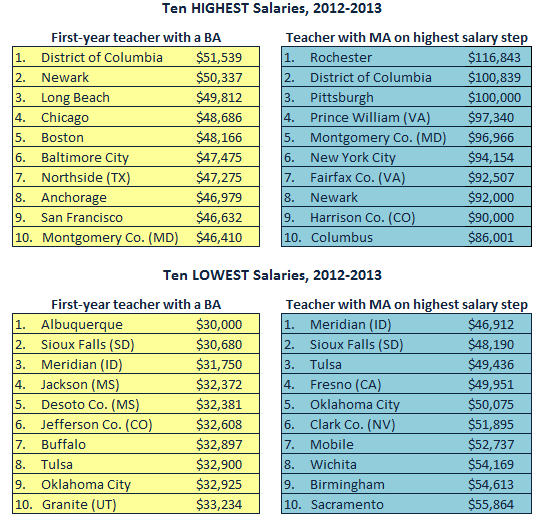 For teachers with master's degrees the salary scale tops out, on average, around $69,000. The highest and lowest paying districts are below. Click here to see a list of salaries for all 114 districts in Tr3. Five of the districts that appear in the top ten lists--D.C., Baltimore City, Newark, Pittsburgh, and Harrison County (CO)--offer significant pay jumps to high performing teachers. The numbers above do not include performance bonuses unless they're already incorporated into the base pay scale. Between the 2011-12 and 2012-13 school years, teachers got a 3% average pay increase for earning an additional year of experience and adjustments for cost-of-living and other factors. Note that these salary changes only take into account the average increase teachers received for earning an additional year of experience and annual adjustments for cost-of-living and other factors. We could not rank all 114 districts since some districts don't base raises on years of experience and others overhauled their pay plans, making it difficult to compare 2011-12 and 2012-13 numbers. Click here for a full list of salary increases in Tr3 districts between 2011-12 and 2012-13. We know of seven districts that made major structural changes to their salary schedules this year. Baltimore City: all teachers are now on the Model Pathways salary schedule, which allows teachers to earn higher salaries based on professional development, strong evaluations, eligible coursework, and student learning gains, among other criteria. Dallas: new hires with advanced degrees will be compensated with only a $1,000 stipend for their advanced degree; there is no longer a separate salary lane for anything beyond a bachelor's degree for hires after fall 2012. Des Moines: new teachers can opt into an alternative contract, which gives them a different pay scale during their first eight years. The alternative contract's annual pay increases of 1.5% are based on enrollment in a professional development program and meeting student growth goals. Douglas County (CO): a new market-based pay scale for new hires was introduced this year. (It will be required for all veteran district teachers in 2013-14.) Teachers are placed in salary bands based on what they teach, and pay is determined by a number of factors, including prior experience, comparable salaries in neighboring districts and supply and demand for the specific teaching positions. Lee County (FL): only teachers rated as highly effective or effective will get raises for completing an additional year of teaching. Minneapolis: salaries are now based strictly on graduate coursework and years of experience. Previously, teachers could earn raises with "professional growth credits", giving teachers 30 different ways to earn higher salaries. Newark: the new "Universal Salary Schedule" is mandatory for all new hires and current district teachers with a BA. It has only one lane--there are no longer raises for graduate coursework--and teachers can only advance to the next salary if they receive a highly effective or effective evaluation rating. Those with highly effective ratings qualify for bonuses totaling as much as $12,500 annually. Go to Tr3's custom report page to access all the data we use in Tr3 Trends and to compare teacher policies in 114 school districts nationwide. Send feedback to gmoored@nctq.org.